The disk space of your Mac is getting smaller and smaller, and you still don't want to delete any of your favorite videos? No worries! With iSkysoft Video Converter Ultimate, you could easily transfer your huge size video or audio files to your external hard drive or USB quickly and easily to save the space of your Mac! 1.Sync your hard drive with your Mac. 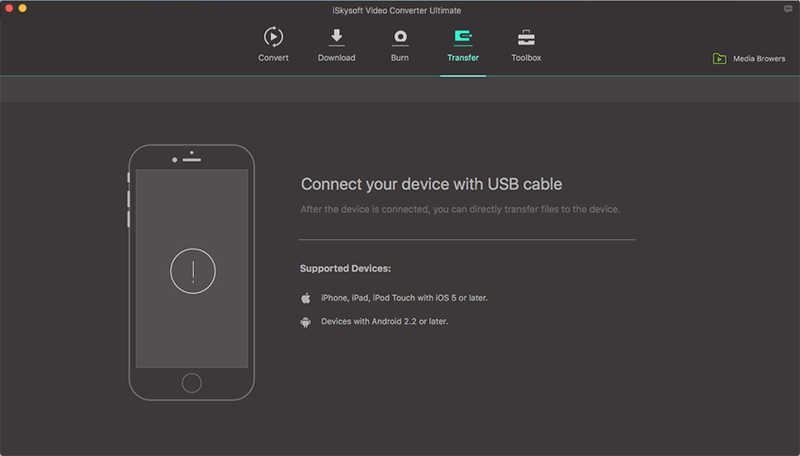 Launch iSkysoft Video Converter Ultimate and switch to the transfer button on the top, then connect your Hard Drive or camcorder with your Mac. Make sure it is recognized by your computer. 2.Select video or audio files to be transferred. Import videos or audio files to the converter using "Add Files" button in the Transfer tab. Alternatively, you can add media files to transfer list from Converted or Finished list in Convert and Download tab separately by clicking "Add to Transfer" button on the right side of each file clip. A third way is to right click on your target file and select "Add to Transfer List". 3.Start to transfer videos to your Hard Drive. When you are ready with the selected files, simply hit the "Transfer All" button. For single file transfer, click "Transfer" button in the display bar of each video. Now you can enjoy your favorite videos or songs on the go!